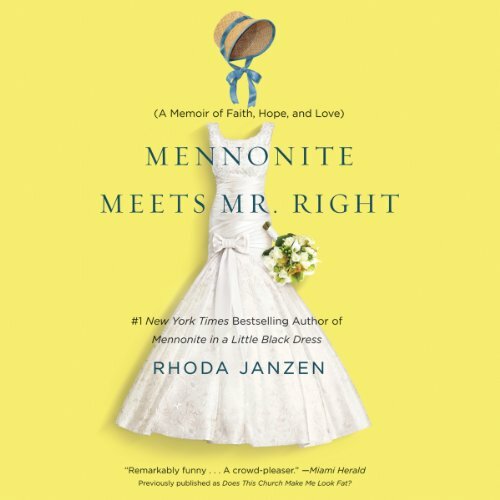 At the end of her best-selling memoir Mennonite in a Little Black Dress, Rhoda Janzen had reconnected with her family roots, though her future felt uncertain. When this overeducated professor starts dating the most unlikely of men-a weight-liftin', church-goin', truck-drivin' rocker named Mitch-she begins a surprising journey to faith and love. Nothing says, "Let's get to know each other!" like lady problems on an epic scale, but Mitch vows to stay by her side. Convinced that his bedrock character has something to do with his Pentecostal church, Rhoda suits up for a brave new world of sparkler pom-poms and hand-clappin' hallelujahs. Written with her trademark "uproarious, bawdy sense of humor" (Minneapolis Star-Tribune), Mennonite Meets Mr. Right is witty and moving, perfect for anyone who has taken an unexpected detour only to find that new roads lead to rich destinations. I loved this and it made me laugh and cry. I adore that the author read this book. The stories she shares are serious but she has a light hearted way of sharing parts of her life. I enjoy the flashbacks. It's great to read another of Janzen ' s books after Little Black Dress. Humor, insight, and profound truth combine to put her in the category with Anne Lamott. What did you love best about Does This Church Make Me Look Fat?? I most often listen to books while I work out. This book had me bursting out laughing regularly. If you liked her first book, you will like this one as well. She does an especially good job emphasizing certain words for real comic effect. She deals with serious issues of faith and cancer without sounding too preachy. I hope she writes another book soon. What about Rhoda Janzen’s performance did you like? Her word choice and emphasis. You could just see her making a funny face, rolling her eyes, etc. as she ennuciated particular words. Nice job addressing her changing ideas about worship and faith. Janzen's previous memoir is a book I've re-read several times, so I was hopeful about this one. Unfortunately, it doesn't have the same strong narrative arc or the loveable characters - in describing her return to her Christian faith and cancer battle, J produces a book which is more like a self-help guide than story. I felt uneasy to discover that the born-again pentecostal she sent up so pointedly in the last book, is her Mr Right in this one. And, in the end, I missed the Janzen family, who were the stars of Little Black Dress.